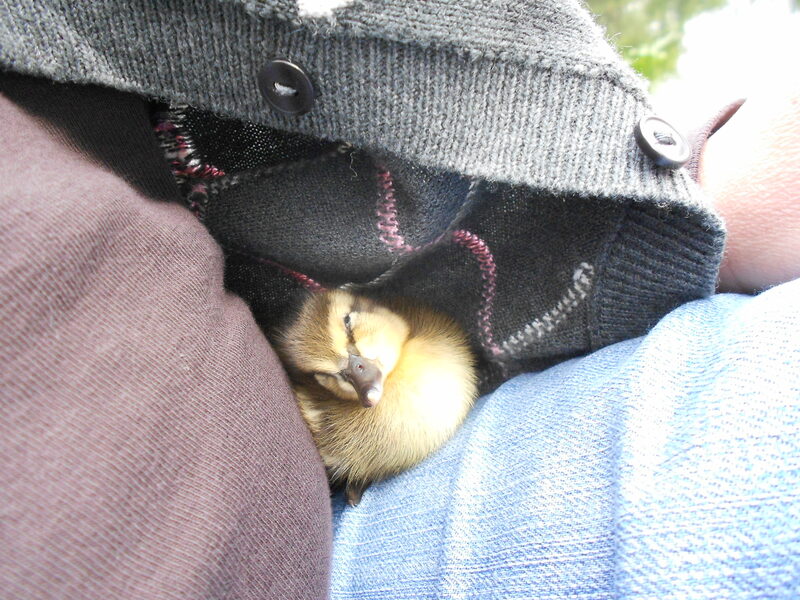 A sleepy duckling nestles under my cardigan on my lap. One to two day old ducklings need almost constant care from their mothers. They need to swim, learn to groom themselves, forage for food, learn to stay close to each other and their mom, and a lot of other life skills a duckling needs, and be still be protected and kept warm enough at all times. 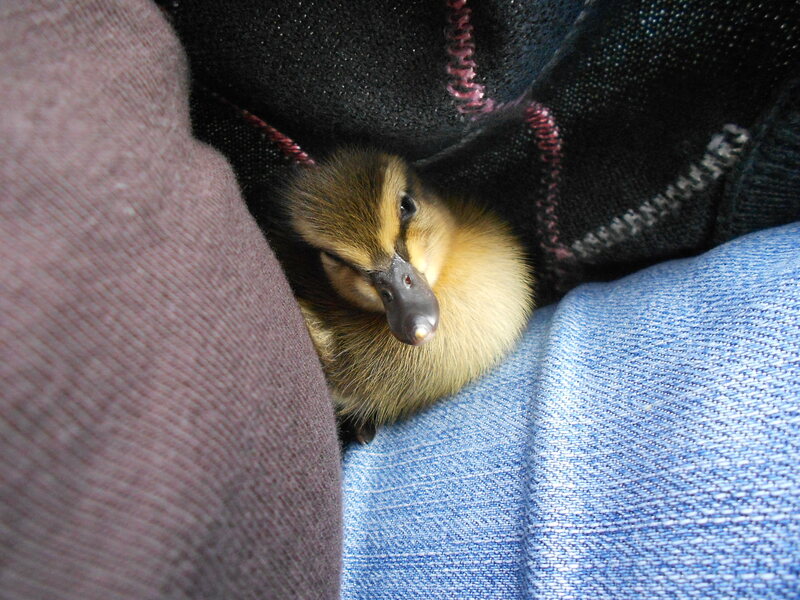 Until they are a few weeks old, ducklings can’t generate enough heat on their own to survive in the outdoors. The younger they are, the more important it is that they do not get too cold. They love the water and it doesn’t take much encouragement to get a duckling to jump into a pond. However after about 10 or 15 minutes they start getting very wet and cold and one by one, they will jump out of the water and look for their mother so they can get under her wings to dry off and warm up. Herding ducklings needs lots of patience. 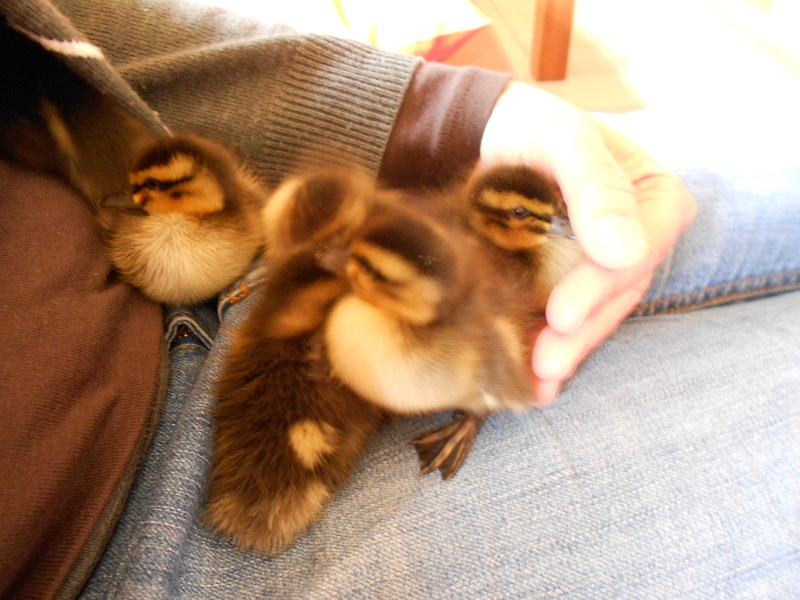 I first caught each duckling as they emerged from the pond and popped them into a box I had for transporting them to and from the brooder indoors. Unfortunately, they were growing stronger every hour and soon I could not keep them from jumping out of the box like they had springs on their little webbed feet. It was almost impossible to get one duck into the box without having another or 2 jumping out at the same time. Even when I succeeded finally in bringing all the ducklings to the brooder, they wouldn’t stay in, and tried their hardest to jump out, flinging their little bodies against the walls and repeatedly falling back down on the floor of the brooder while peeping loudly and desperately the whole time. 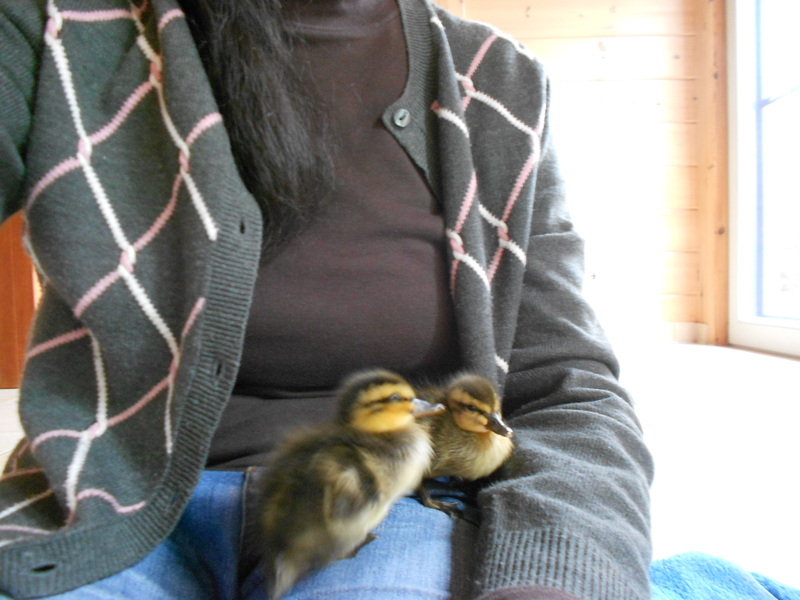 This was simply too heartbreaking and hard to watch so I finally let them out of the brooder, then sat on the floor and let them climb in my lap and under my cardigan to sleep. At first they were not used to this and didn’t know how to get on my lap – I had to scoop them off the floor and then herd them into a little group on my lap with my arm, but very quickly, they caught on to this procedure and were able to jump up from the floor onto my leg and run up to where their siblings were already fighting for the best and warmest spots (namely, in my cardigan under my arm). Once all of them had found a comfortable position they would cheep and chirp to each other softly and contentedly, until one by one, they fell asleep. Finally settled down and ready to nap. It’s an indescribable feeling to have this warm pile of downy beings snuggling up to you, so trusting and so dependent. The largest one of them, which I called Quakie Junior (because he or she was so aggressive!) was the most active and strong, the first to wake up, last to sleep, the one who jumped the highest and made the most noise. She (or he) was impatient to see the world and find things to peck at. If, in her opinion, the ducklings spent too much time indoors or sleeping, she would jump on her siblings and peck at them viciously. I had to hold her away from the others at times so that they could get to sleep at all. 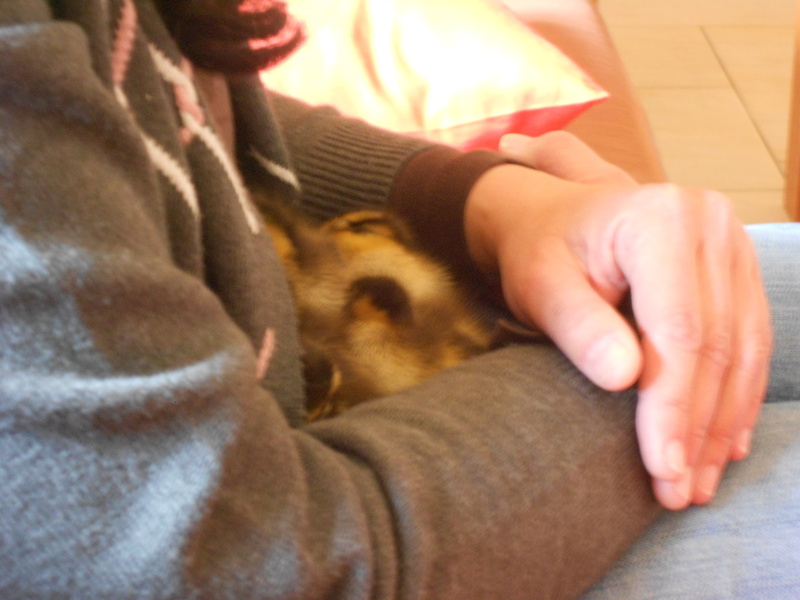 Then I would put her under my arm till she got warm and sleepy and finally went to sleep as well. After all she was also still a baby!